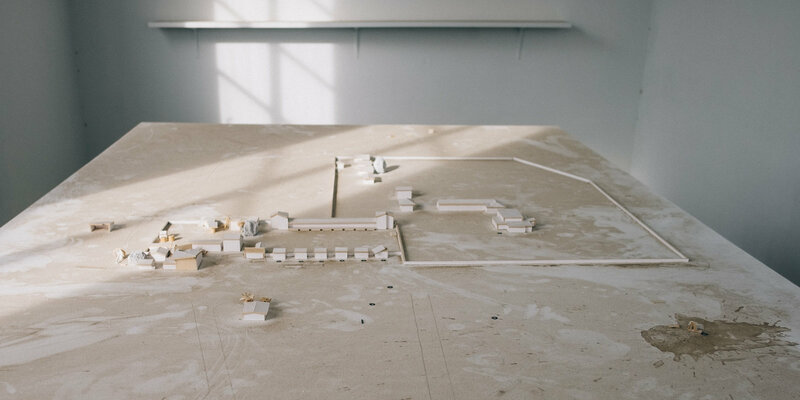 lithium brines, water politics, and decaying art. Photos and text by Logan Williams. 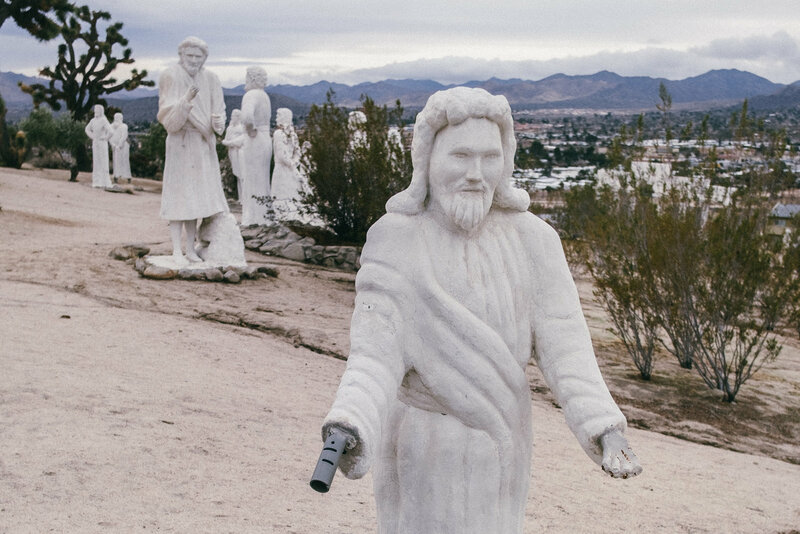 Past the Vons at the intersection, the five lane highway with the dashed yellow turn lane, and just across the street from a development of new exurban duplexes stand dozens of steel reinforced concrete biblical figures. 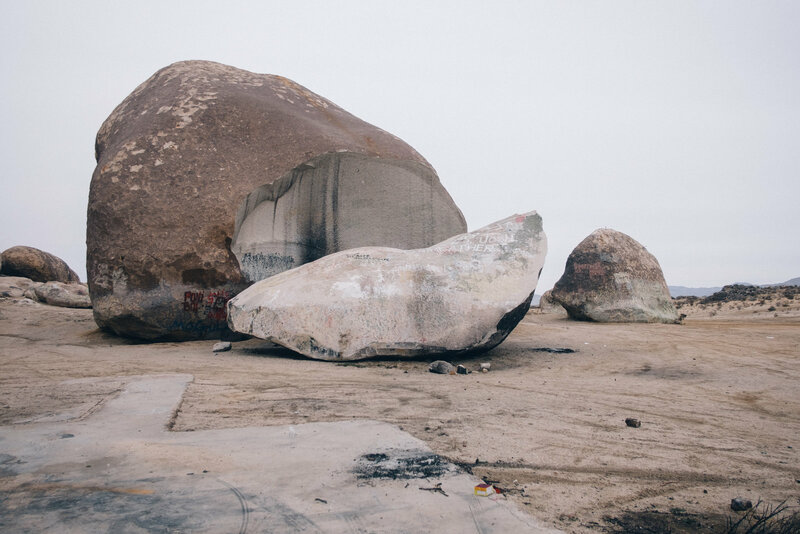 These sculptures, built to inspire world peace in a time of imminent nuclear catastrophe, now stand in various states of decay. They have been unmaintained for over 50 years, including a decade-long period during which the property was virtually abandoned. It is a testament to the mummifying qualities of the high desert that any of these are still here at all. It seems certain that this preservational quality also inspires a certain amount of neglect. 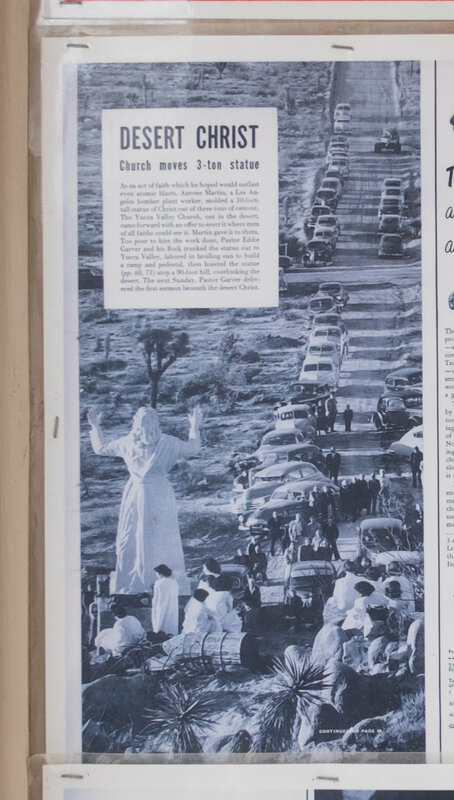 While Alison and I had seen elements of this in every abandoned shack and wheel rut we passed, it was especially obvious in Desert Christ — and Noah Purifoy's outdoor museum, which we had visited a few days before. It is as though, freed from the struggle to compete with fast-paced biological processes that more temperate climates require, people in the desert are more comfortable letting things fall apart. Or those that feel that way wind up here. When one does decide to fight the inevitable return of sculpture to sand, it can be harder than it might first seem. 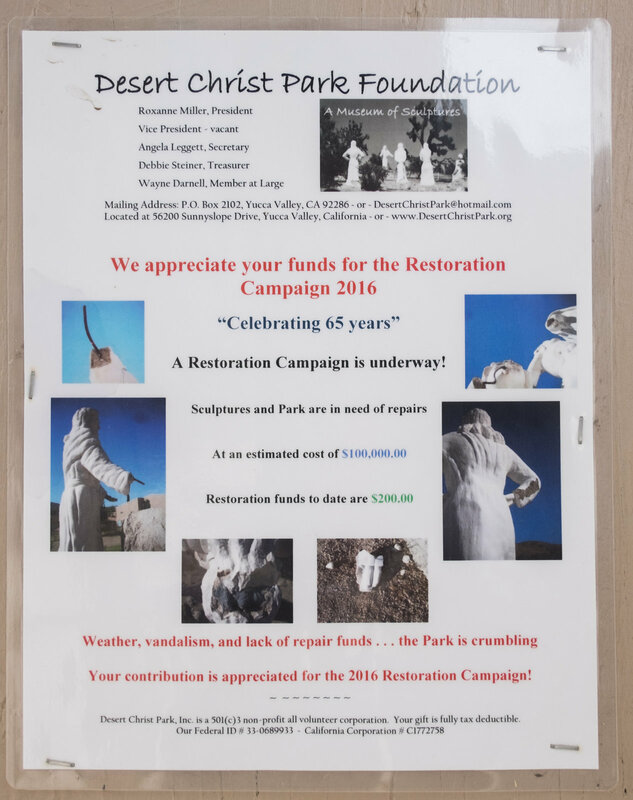 While the Noah Purifoy gallery has hung on for now, a restoration campaign for Desert Christ has raised just $200 out of a goal of $100,000. The only thing more audacious than driving these sculptures out to the desert was trying to keep them here. North a few dozen miles, through the tiny town of Lander and down a moguled dirt road, there’s a giant rock. Two of them, now. Alison and I have driven out here this morning to see these giant rocks with our own eyes. There is a satisfying blankness to the landscape on the way out there, and our boxy rental car looks unusually photogenic against this backdrop. 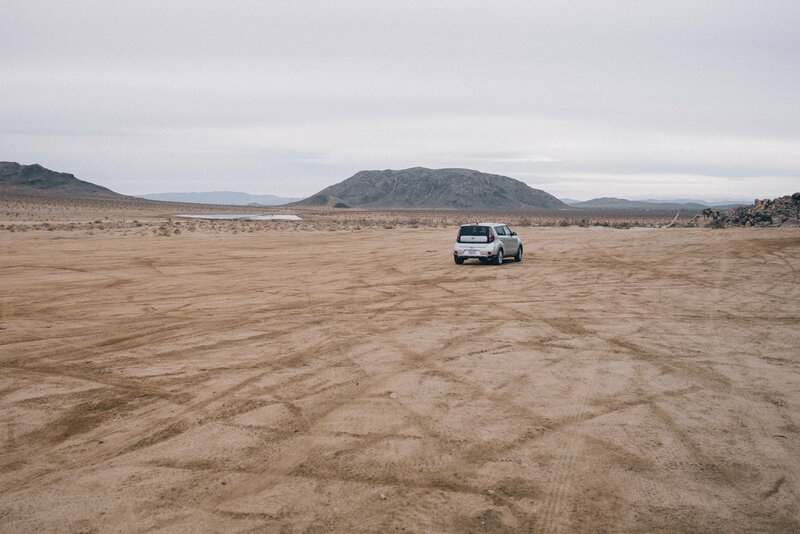 One can easily see why so many car commercials are filmed in the Mojave desert. 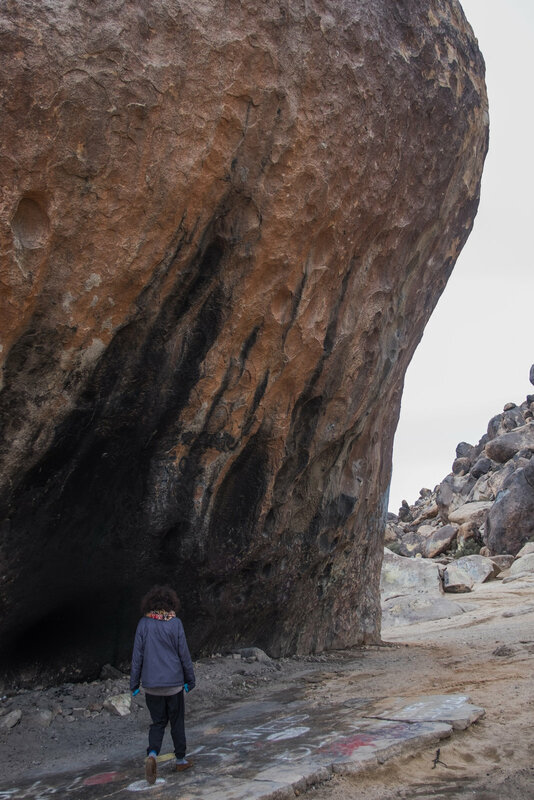 The enormous boulder split after it was blown up in a botched 1930s police raid. Local authorities suspected the eccentric German amateur radio enthusiast who lived in a cave he excavated beneath the rock might be a spy. To be fair, he had also installed radio antennas on top of the rock. Afterwards, thanks to the influence of a former friend, the rock became the site of decades of extraterrestrial conspiracy theorist gatherings. Now, it is a place in the desert you can drive out to to burn Christmas trees. The desert has always been a place for individuality, almost expressly so. 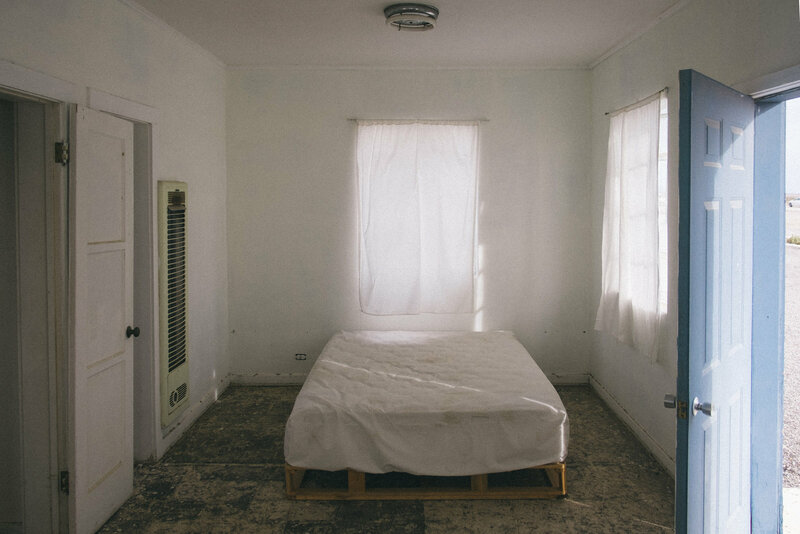 But as civilization seeps outwards, and especially as the Californian coastal housing crisis reaches long tentacles of consequence into the interior, is this still the case? Is there still room for the hermits who want to live, literally, under a rock? Is the Mojave Desert being made into some kind of image of itself, and are Alison and I the loathsome David Foster Wallacean (rhymes with crustacean, obviously) “insects on a dead thing?” Or perhaps this has always been the way things are. The desert has been glorified by a thousand (and one) cliches for a long time. 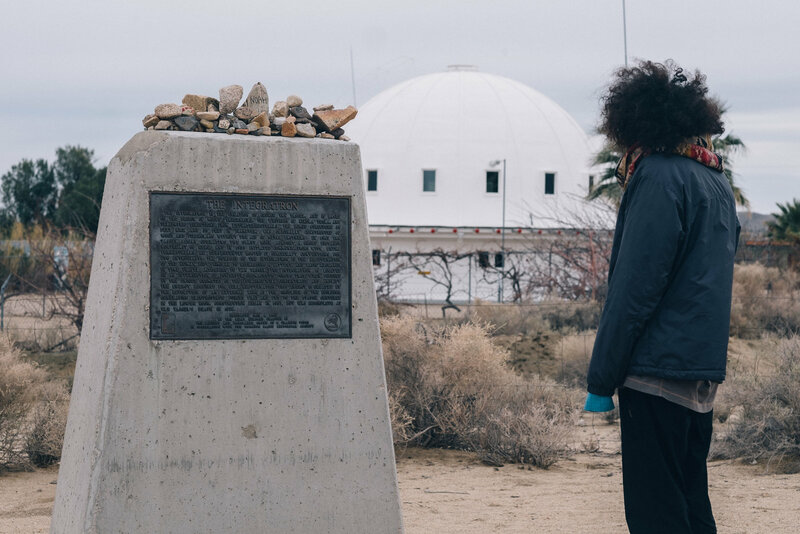 We pass The Integratron on our way back through Landers. The new age landmark now features a weather-beaten explanatory plaque and chain-link fence. A few days ago, we left the Joshua Tree Wilderness, where backpackers aren’t permitted to drink from any natural water source. Even during our rainy December hike, which took us through narrow canyons with water gurgling beneath the boulders, we were not to drink it. Whether by providing a watering hole to bighorn sheep or seeping through the sandy soil into an underground aquifer to sustain the creosote and yucca for another hundred years, every drop of water has a role in this ecosystem. Every drop of water drawn off by backpackers would push some other organism out of the desert and into oblivion. There’s an awareness of one’s own impact that can hit suddenly while hiking, perhaps from seeing remnants of previous camp, maybe a too-friendly songbird, or even just a footprint in the mud. This is how I feel now. The desert is a landscape that maintains foreign artifact for so long, and yet, somehow in spite of this, because of this, its natural systems are intensely fragile. If there was ever a place where one action could exert an unexpectedly large influence, it would be here. 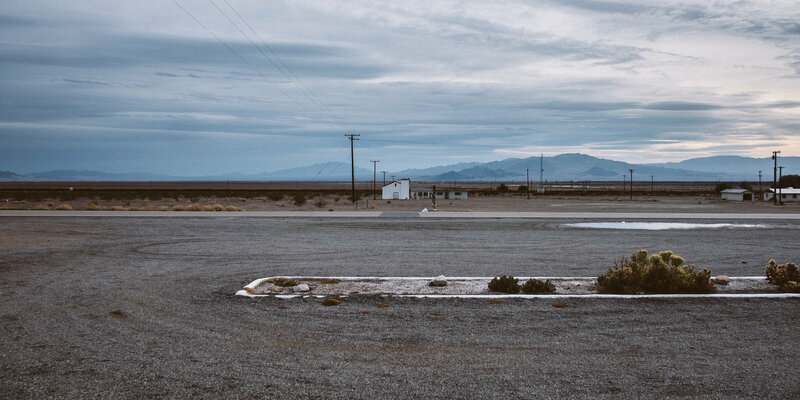 We drive on, past The Palms, a bar off the highway down Amboy Road, a location that High Desert Test Sites describes as “the end of nowhere.” Our route towards Utah will take us further down this road, through the Mojave National Preserve and Las Vegas. 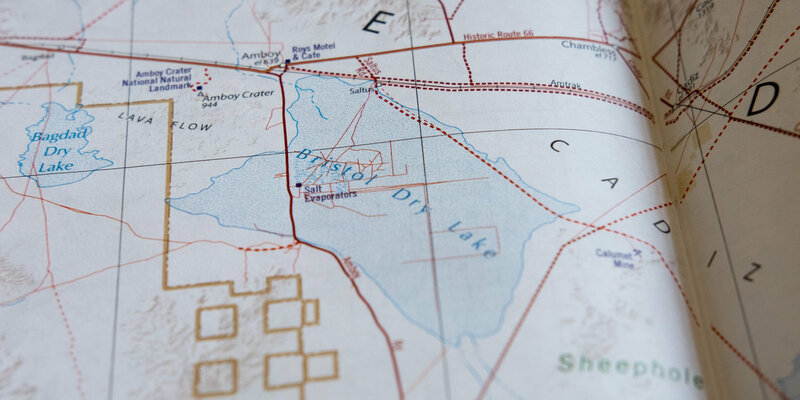 Looking at our maps, we were intrigued by a site on the way, “Salt Evaporators” at Bristol Dry Lake. 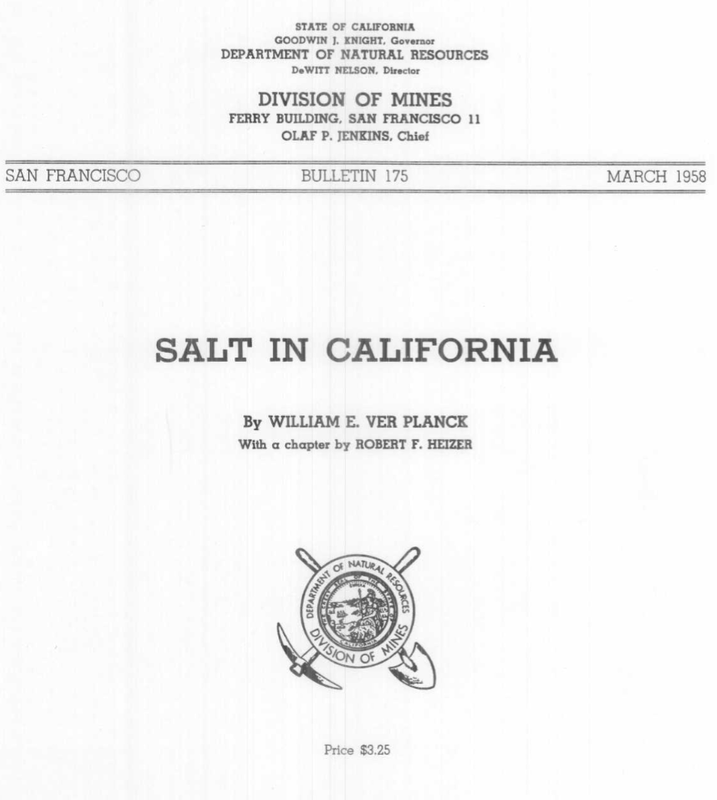 While familiar with sea-side salt evaporation ponds (the Bay Area used to be full of them) and underground salt mines, I had no idea how salt mining on a dry playa worked. 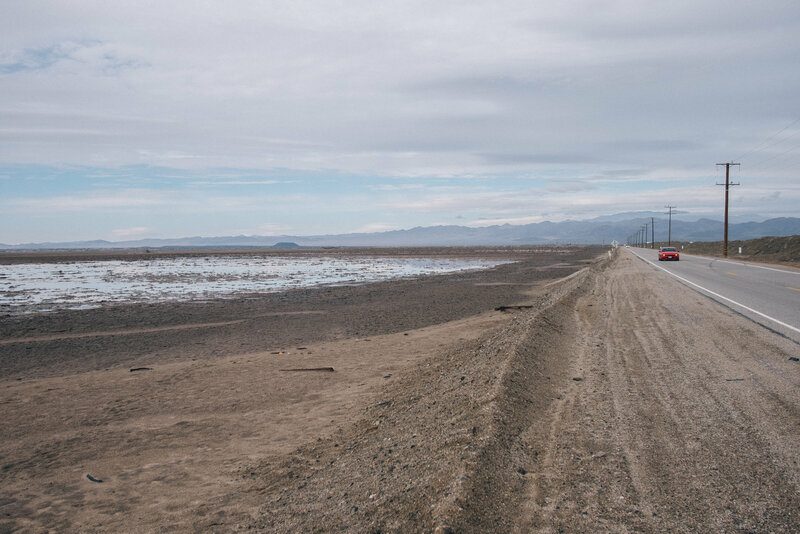 Amboy Road crosses a seemingly endless alluvial slope on the edge of the Sheephole Mountains before entering the dry Bristol Lake bed. The bottom image is taken from Google Earth looking south. Given the recent winter rainfall, the playa wasn’t exactly dry when we drove though. The first sign that our alluvial fan traverse was nearly finished was seeing surface water. On the other side of the flooded lake bed, we could also see the symmetrical shape of Amboy Crater, a cinder cone rising from a relatively isolated lava flow. The distant Amboy crater rises above water pooling on the side of the road in Bristol Lake. We pulled to the side of the road and, stepping carefully to avoid falling knee-deep into the recently flooded soil, found a trench dug through the top layer of the lake bed to the briny water beneath. Under the summer sun, these trenches can glow a tropical turqouise, but today the water was solemn and reflected the gray sky above. On the rainy winter day of our visit, the soft mud surrounding the trenches did not permit extended exploration. Salt extraction from this area has been happening for quite some time, as described in the 1958 page-turner Salt in California. A drone survey of Tetra’s salt facility at Bristol Lake reveals its large extent, barely visible from the road. In 1998, the salt mining operation at Bristol Lake was purchased by Tetra Technologies, Inc, an oil and gas services company that also happens to be the world’s largest manufacturer of calcium chloride. I was curious how much the salt trenches at Bristol Lake have changed over the years, and what impact the bureaucratic affair of ownership transition may have had on the physical landscape. Using Google Earth and the “print screen” key, I animated some aerial imagery from the last twenty years. As you scroll, the aerial images will animate on top of the map on the right. It looks like its been pretty peaceful out there, but there may be some intriguing development next door soon. A Canadian company, Standard Lithium has obtained pieces of Bristol Lake from National Chloride to begin lithium brine evaporation operations. The demand for lithium has been rising quickly in the past year, driven by an ever-increasing need for lithium-ion batteries. 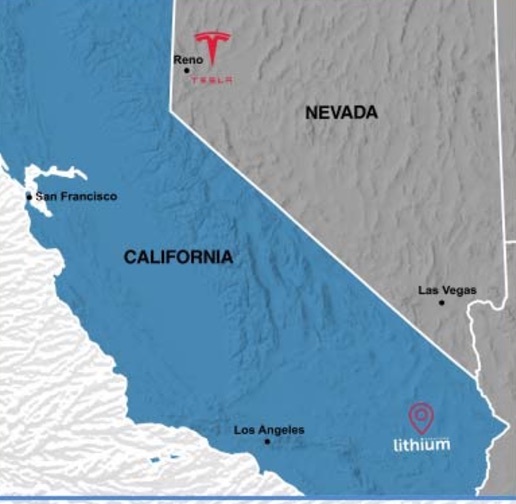 Tesla’s new “giga-factory” is just one state away, and this is a geographic situation the company is quick to mention in its investor pitch decks. Lithium, Tesla. Tesla, Lithium. Image from Standard Lithium. They are actively seeking investment. A re-edit of a Standard Lithium promotional video. Let’s zoom out from Bristol Lake a bit, and look at the entire region over a forty year time scale. You can see winter rains push around the whitish salt deposits on Bristol Lake. The streaky region to the left of that is Amboy Crater’s lava flow. And, just to the east of Bristol Lake, something changing — and conspicuously rectangular. Around 1985, these dark green squares sprung from the desert, grew, and then faded away. Are they... agriculture? Some kind of agricultural experiment? A show of botanical hubris echoing Stanley Ragsdale's date palm geoglyphs one hundred miles south in Desert Center? ...and driest parts of the Mojave Desert? We leave the salt trenches and head towards our next crossroads, with the famous Route 66. Enroute, we see a mysterious sign for something called “Matza Amboy.” It looks like a contemporary art exhibition. From a geographic perspective, given the desolate utilitarian surroundings this is surprising. 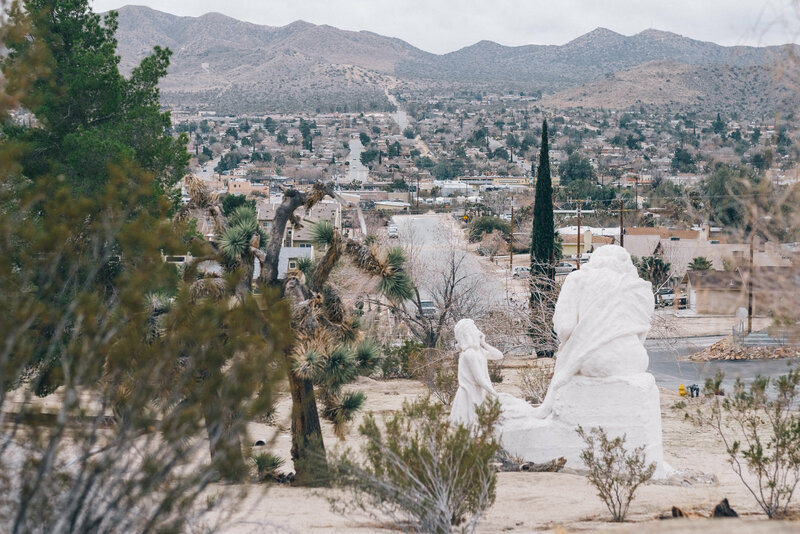 From a temporal perspective, in the context of Desert Christ and Krblin Jihn, Frank Critzer, Noah Purifoy and the Integratron, it is the most natural thing. 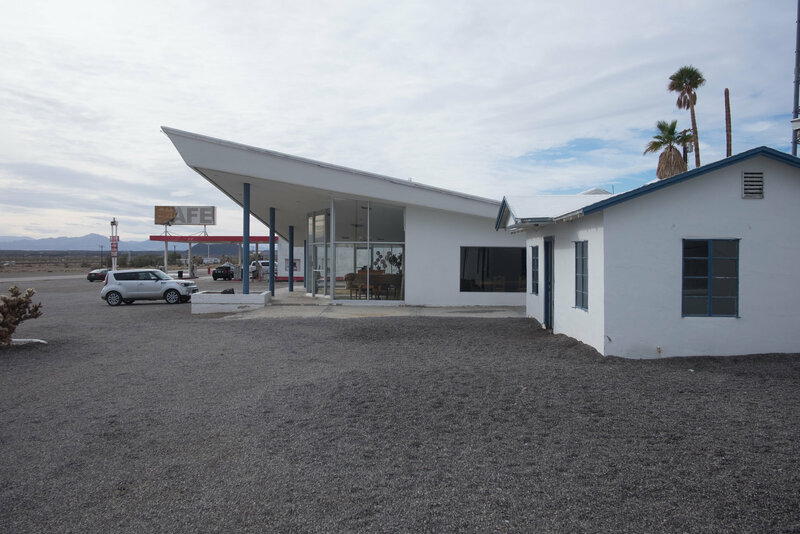 We pull into the town itself and stop at Roy’s Cafe, pretty much the only business in Amboy, California (and no longer even a cafe) to find out what the deal was. The man behind the counter at Roy’s is busy flipping through a photo album with another visitor. There are hundreds of photographs, all of a motorcycle, a man, and a scantily-clad woman, without any visible exceptions. There are about three unique men in all of the photographs. There is only one woman. She is in every photograph. “What’s Matza Amboy?” we ask. “Some kind of art thing,” the man behind the counter responds. 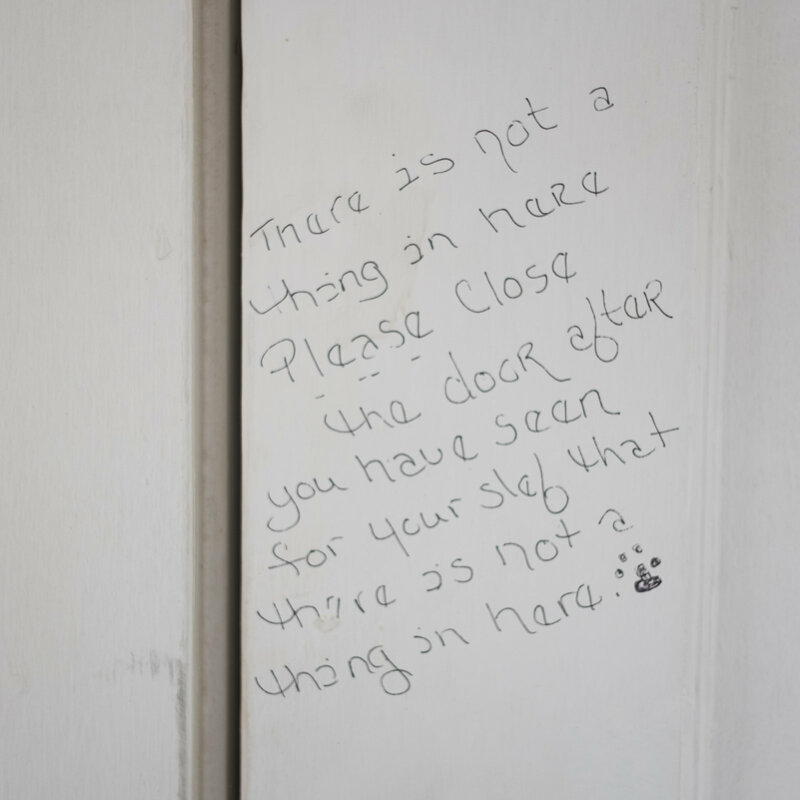 “If it hasn’t been stolen,” he says, gesturing to a row of motel cabins along the road. True to his word, many of the pieces have been vandalized, though its not always clear what is the result of people and what is the result of the environment. One thing that is clear is that an architect has been here. The representation is as dusty as the reality. Many of the pieces that remain are related to water. 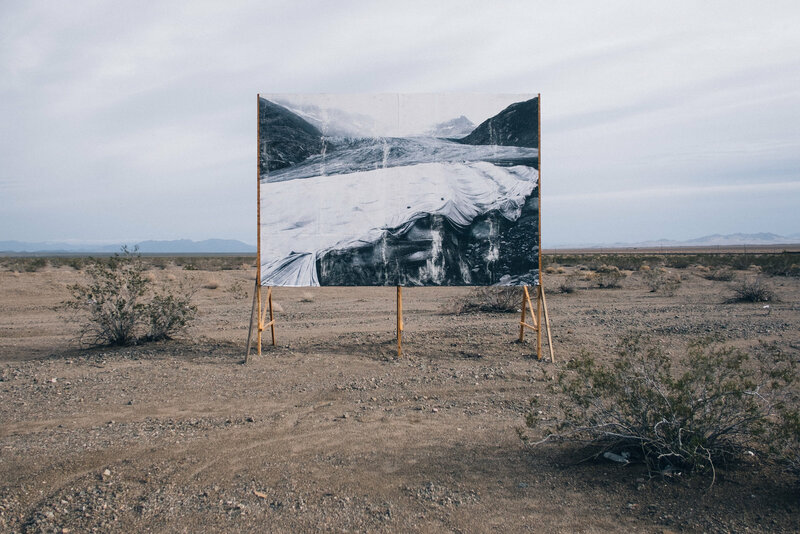 A billboard of a melting glacier stands in some kind of climatic solidarity with the desert that surrounds it. 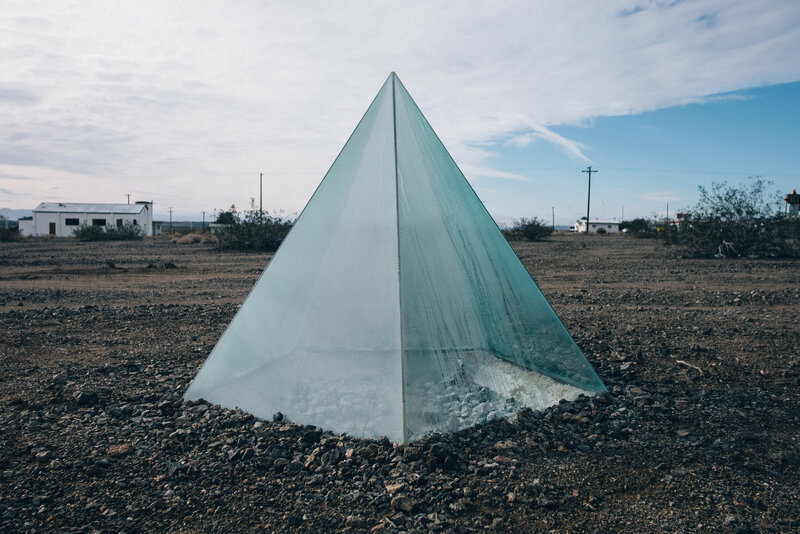 A glass pyramid precipitates whatever atmospheric moisture it can collect into a spigot that runs to the nearest creosote bush. An obsession with water is natural for humans in the desert, natural for people anywhere in California even. But this community in particular has more reason than most to worry over it. Their concern began when a British horse racing enthusiast (and investment banker) met an American geologist. Cadiz Inc. was founded in 1983 after acquiring 11,000 acres of land in the Cadiz Valley of eastern San Bernardino County, California. A NASA-funded research project that integrated satellite imagery with geological, geophysical, and geochemical survey methods played a major role in the selection and evaluation of the land. Through analysis of the NASA research, the founders of the Company determined that our land was situated over a large, naturally recharging aquifer system able to provide a high-quality, reliable water supply to southern Californians, as well as much-needed underground storage for surplus water. Any example of public investment in scientific research and natural resources lining the pockets of investment bankers worth understanding more (🌹), so I attempted to dig a little bit, starting with their origin story. I couldn't find the company's earliest land acquisitions, but their current holdings are now superimposed on the map in red. I also managed to find a handful of references to the NASA research that the geologist, Mark Liggett, participated in, despite limited online footprints. Mark Liggett cited in the 1972 Pomona College Geology Department newsletter. This publicly funded research looked at a a variety of methods for identifying underground aquifers using satellite imaging, which was relatively new at the time. 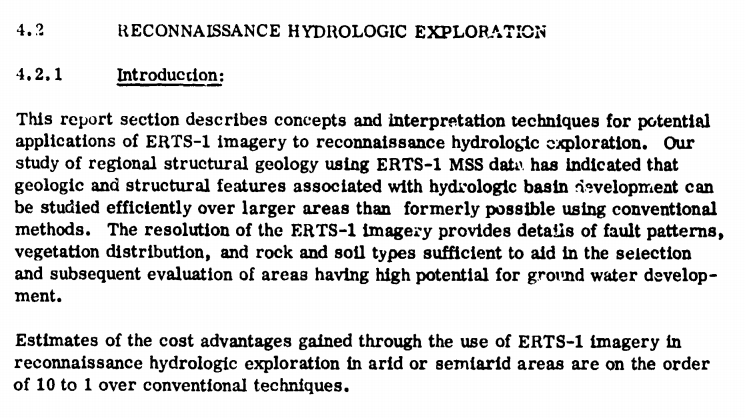 An excerpt from a 1974 NASA technical report on remote sensing for hydrology. Mark Liggett was on the research team. Public articles by Farouk El-Baz, a pioneering remote sensing researcher at Boston University, and a 1982 USGS report shed further light on how analysis of aquifers from satellite works. Large scale satellite imaging makes it easier to identify subtle landforms and drainage lines. Near infrared images show vegetated regions that grow around remote springs. Thermal imaging after rainfall reveals basins that retain water by their anomalous lack of warmth. Water revealed in Darfur after rainfall. While the desert around the basin has warmed, where water collected has remained cool. Image from Farouk El-Baz. This satellite data is now more accessible than ever. What natural water resources, especially international water resources, are still waiting for the right investment banker to come along? A re-edit of a Cadiz Water Project promotional video. So someone used publicly funded research to find water and founded a company around extracting it. But that’s by no means a guaranteed capitalist success story. Cadiz also needed water rights, and to use the water for urban development, a way to transport it and someone to transport it to. But agriculture was never Cadiz’s primary goal, and while spending the decades wheeling and dealing with various southern water districts, hiring geologists, and digging exploratory wells, Cadiz only ever developed a small portion of their land for agriculture. Recently, in 2013, they abandoned this pretext altogether, and sold their lemon orchard to Limoneira, a California-based citrus concern. 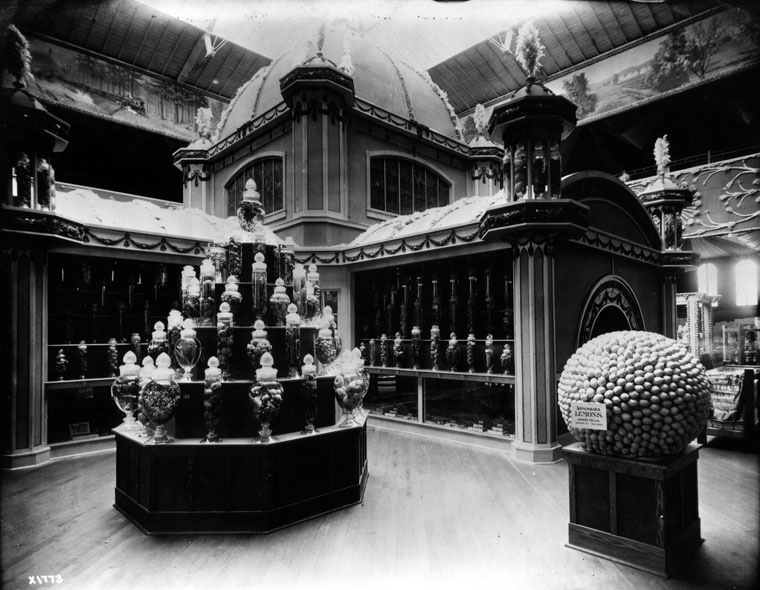 At the 1909 Alaska-Yukon-Pacific exposition, Limoneira exhibited a giant ball of lemons. In 2010, Cadiz found a partner for their water endeavor. Nearly two decades after they were granted the groundwater extraction permit for their lemon orchard, Cadiz convinced the Santa Margarita Water District, in conservative Orange County, to lead the environmental review process necessary for urban use of their water. Cadiz’s critics are a diverse bunch — offbeat off-gridders, local ranchers, governments of towns that rely on groundwater, other large natural resource companies and distant environmental policy advocates. 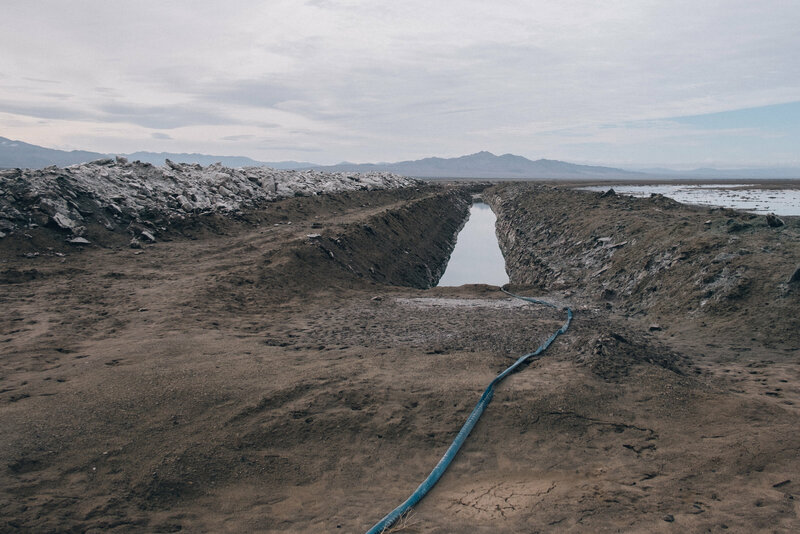 They readily point out that the evaporation justification fails to make sense — intermittent surface flows, from which water can evaporate, are just that, intermittent, while Cadiz would be continuously pumping water into transportation infrastructure directly exposed to the southwest sun. But the biggest point of disagreement is over the natural recharge rate of the aquifer. Is the large size of the Cadiz aquifer today a result of a millennia-long slow trickle, or a faucet that’s reached equilibrium with input and output? Overestimating the aquifer’s ability to recharge, and subsequently draining it, could cause severe and unpredictable impacts across the region. Remote springs could go dry, reducing the range of borderline desert vegetation and the vulnerable desert bighorn sheep, tortoise, and other species. Residential wells in remote communities could be subject to saltwater intrusion. While Cadiz claims that the natural recharge rate is sufficient to prevent these impacts, evaluating aquifer recharge rates is tricky. 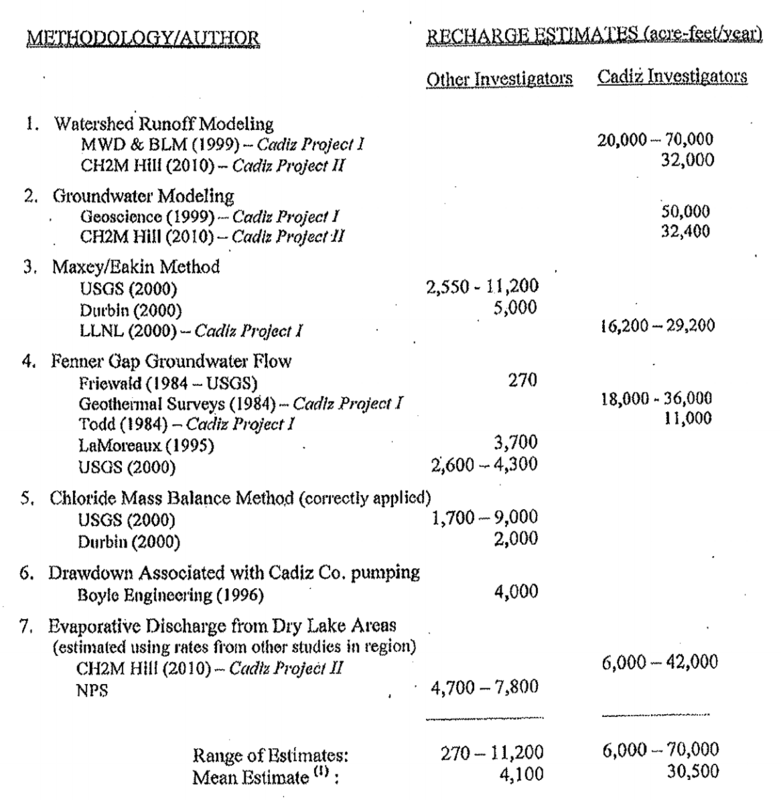 A review of the published geologic reports by Senator Feinstein (D-CA) and her team showed that most studies pointing to high natural recharge rates were directly funded by the Cadiz company. Estimates for natural recharge rates of the Cadiz aquifer differ greatly depending on where the funding for the study came from. Furthermore, regulating established aquifer draw can be itself difficult, as has been seen in densely settled and farmed regions of California like the Central Valley. A more recent NASA research study suggests that one third of major global aquifers are distressed. Left: Bonanza Spring, an oasis of cottonwoods and willows that attracts animals from dozens of miles away, is vital for desert life. Image from Bureau of Land Management. 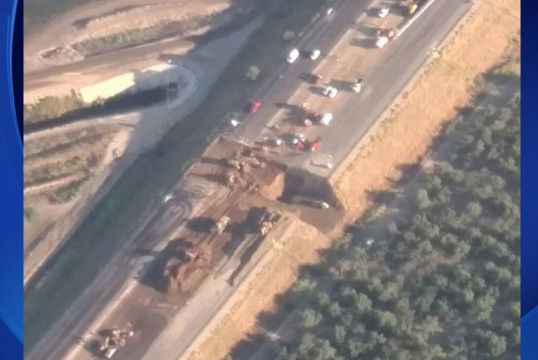 Right: land subsidence caused by aquifer depletion damaged Interstate 5 in Central California. Image from CBS San Francisco. Cadiz has made enemies of more than environmentalists over the course of its several decade long endeavor to mine water from the Mojave. In the 1990s, it was embroiled in a battle with a waste management company that wanted to build a new waste dump for Los Angeles on top of the Cadiz aquifer. And remember Tetra, the new owners of the Bristol Lake calcium chloride ponds we stopped at? Lately, they’ve been fighting Cadiz out of concern that falling water tables will make it more difficult to collect brine in their trenches. But for now, Cadiz has done their paperwork — Cadiz owns the land, and they have followed the California process for their right to extract it. The major unsolved problem that they face is the transportation of this water. To this end, they recently signed a 99-year lease on an entire rail line (highlighted on the map in yellow), stretching from Route 66 to the Colorado River Aqueduct, 60 miles southwest. Cadiz claims that they have done so in order to build a scenic railroad. An artist’s depiction of the Cadiz Southeastern Railway. Presumably, they have drawn all three of the passengers on the train. Image from Cadiz, Inc. While a scenic railway through the Mojave would likely be a wonderful way to experience the beauty and isolation of the high desert, I find it difficult to believe that visitation would be adequate for such an endeavor to even be tolerated by investors, let alone be a financially solvent business unit. In the half hour that we spent ambling around Amboy, we saw just one other party stop by. This is not a bustling touristic center. The parking lot at Roy’s in Amboy. Cadiz’s obvious purpose with the railway lease is to utilize the land for a pipeline to carry water to the Colorado River Aqueduct. By building their conveyance in a railroad right of way, they hope that the General Railway Right of Way Act of 1875 allows an additional round of environmental review to be bypassed. Advocates have cried foul, claiming that the pipeline construction does not “derive from or further a railway purpose.” In 2015, the California director of the Bureau of Land Management (BLM) agreed, requiring additional approval for the construction of a pipeline, and the future of the water project, and the company, was cast into doubt. But in November 2016, Cadiz’s stock dramatically jumped, and began a significant bull run. 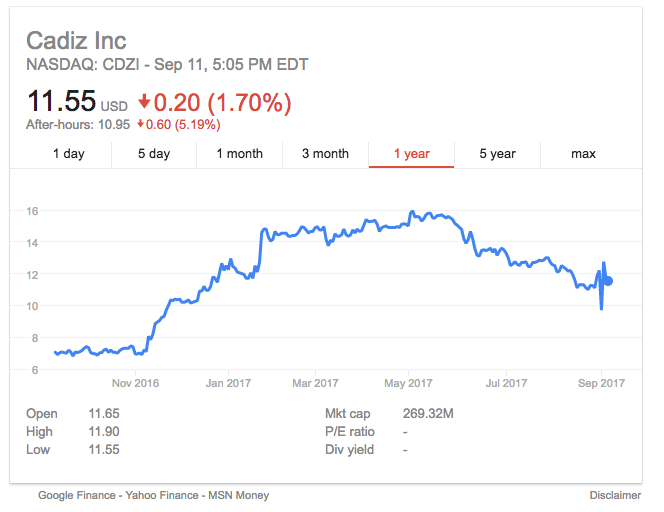 Cadiz's stock jumped markedly after the surprise outcome of the 2016 election. Image from Google Finance. This is interesting timing! Investors likely anticipated an easier regulatory environment with a Trump administration running the Department of the Interior. Then in January, the stock jumped again. Image from Trump transition team. 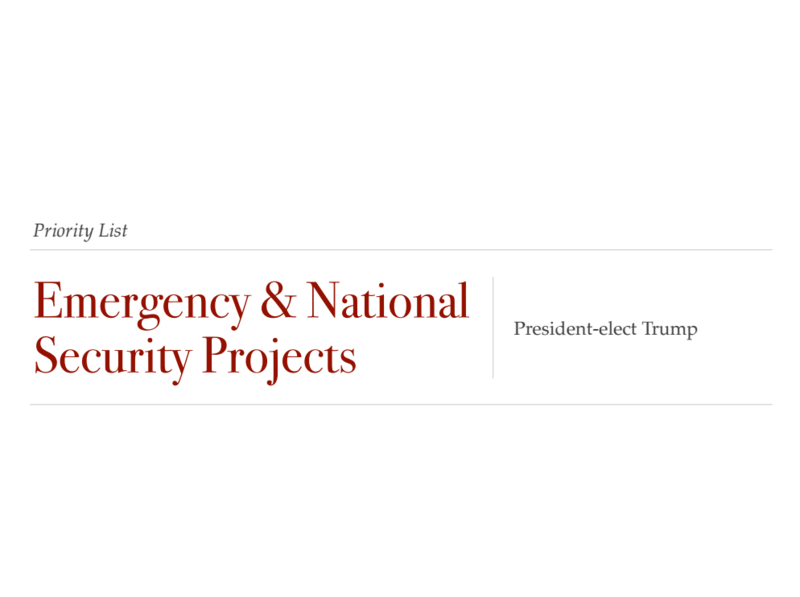 In a major infrastructure announcement on January 24th, president-elect Trump’s transition team released a preliminary list of 50 “Emergency & National Security” projects, and it featured the private Cadiz water venture as number 15. Soon after, as if further signal of the administration’s desire to push this project through were necessary, Trump picked David Bernhardt for his deputy Secretary of the Interior. Bernhardt is a senior partner at a lobbying firm that counts both Cadiz and powerful irrigation districts as clients. There’s another layer to investor’s glee at Trump’s interest in this project, one that has been causing controversy far outside the Mojave Desert. The creation of national monuments, an executive power authorized by the 1906 Antiquities Act, has been increasingly contentious in recent years. Monuments can only be created from already public lands, which in the desert West is almost everywhere. While the creation of a monument does not change existing land use, it does make it much more difficult for new exploitation, such as new mining and drilling leases. Because national monuments enforce a conservationist land management policy, and perhaps also because the non-legislative creation process is viewed as executive overreach, right-wing interests in the West generally oppose the construction of new monuments. In May, the Trump administration started a review of all monuments created under the Obama administration, and in August, Secretary of the Interior Ryan Zinke indicated plans to dramatically shrink many of them. One of these new monuments under review is the Mojave Trails National Monument, created in February 2016. It is now highlighted in green. The creation of this National Monument muddied the regulatory waters. It certainly meant it would be more difficult to get BLM approval for a any pipeline. Notice how much of the railroad right of way that Cadiz is leasing lies within the monument boundaries. 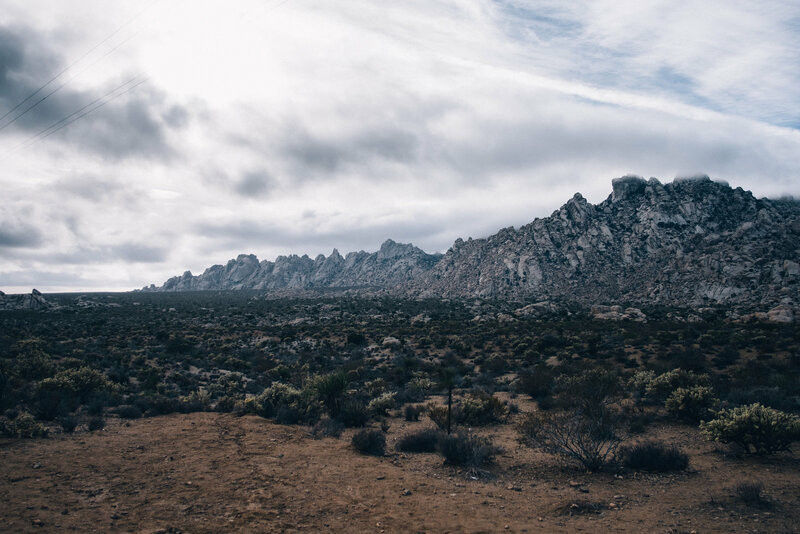 In public discussions, monument status would provide environmental advocates with more justification for defending the value of the pristine desert landscape. Still, conservationists in the state legislature haven't been taking any chances. A bill in the California House of Representatives, A.B. 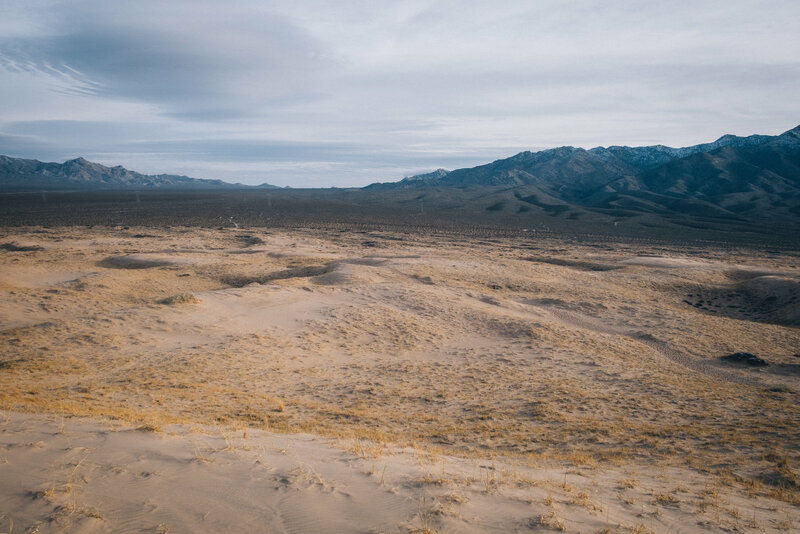 1000 would make environmental standards for groundwater transfers in the Mojave significantly more stringent — essentially a bill to block Cadiz. Cadiz's stock rose in September after a bill to block the project was killed in committee. Image from Google Finance. 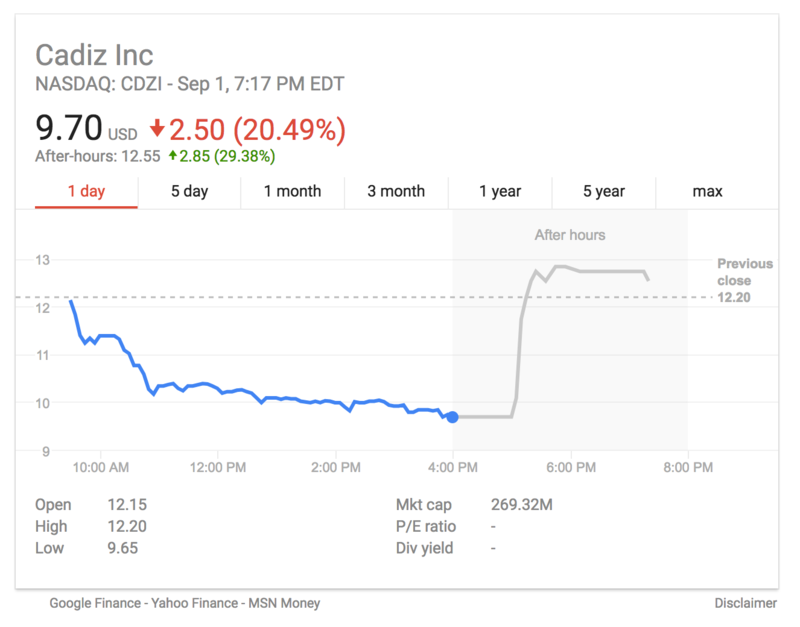 Cadiz stock spiked 30% in trading after the late announcement from California. Despite a state legislature that wants Cadiz’s troubled EIR to stand, and a sympathetic Department of the Interior, this may not be the end of Cadiz’s regulatory hurdles. Recently, there are signs that A.B. 1000 might be given a second life, and with California power broker Sen. Diane Feinstein a fierce advocate for the bill, anything could be possible. So who’s buying this water? And how much does it really matter? Cadiz plans to push the water through a pipeline along the railroad right of way, into the Colorado River Aqueduct. From there it would join water from Colorado, Wyoming, Utah, New Mexio, and Arizona to be pumped over three mountain ranges and through a fifty mile tunnel along the southern boundary of Joshua Tree National Park. 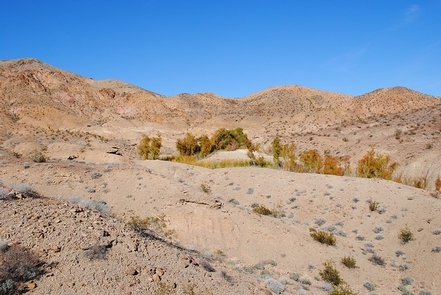 After crossing the San Jacinto mountains, the water from the Cadiz basin would enter the Greater Los Angeles water distribution system, ultimately bound for the eastern half of Orange County. A small local agency there, the Santa Margirata Water District (SMWD), has agreed to purchase the first of the water. 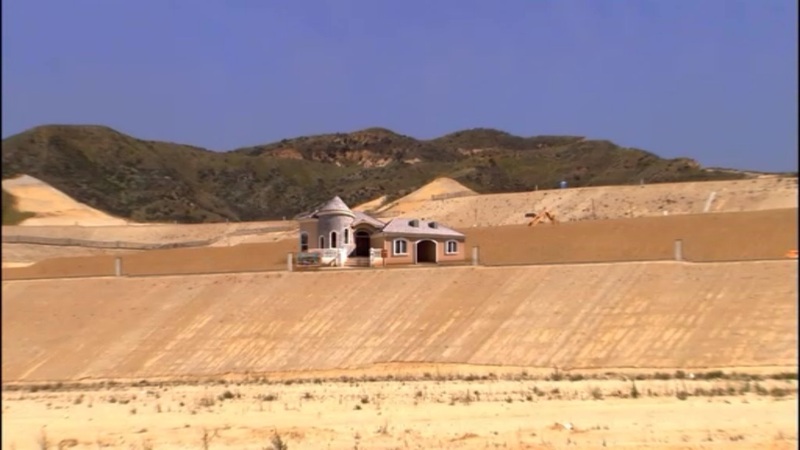 By doing this, and by supporting the environmental review process, SMWD been instrumental in supporting the efforts of Cadiz, Inc.
Rancho Santa Margarita, at the center of this water district, is also the location of the farcical Sudden Valley development in the sitcom Arrested Development. Image from Fox. Ironically for this arid region, the second largest employer in Rancho Santa Margarita is a landscaping company with nearly 1,000 workers. 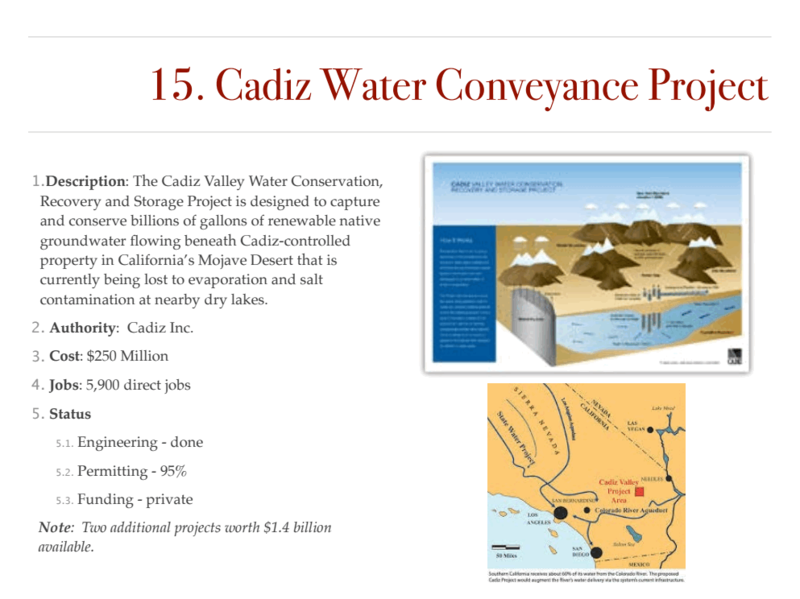 Cadiz plans to pump 50,000 acre-feet of water per year, of which SMWD will buy only a portion. The rest would be distributed to the surrounding region. The largest provider of water to thirsty Southern California is the California State Water Project (or SWP.) SWP carries water from the snowy northern Sierra Nevada down to San Jose, Bakersfield, and Los Angeles. Along the way, the SWP reverses the flow of rivers and lifts water over mountain ranges, making the project the largest electricity consumer in the State of California. The SWP is capable of delivering 2.4 million acre feet of water each year. This is fifty times the proposed capacity of Cadiz’s project, a drop in the bucket. The Colorado River Aqueduct, through which Cadiz is proposing transporting its water, already moves an additional 1.2 million acre feet of water per year to urbanized Southern California. A spectacular map of the Colorado River Aqueduct from 1938. Note the compact size of the urbanized region in the Los Angeles basin. At this time, the San Bernardino valley was still rural ranch land. This tiny relative change in Southern California’s water budget could easily be achieved through conservation. The average residential customer in the Santa Margarita Water District used over 160 gallons/day in 2017, more than half again as much as typical usage in the Bay Area. 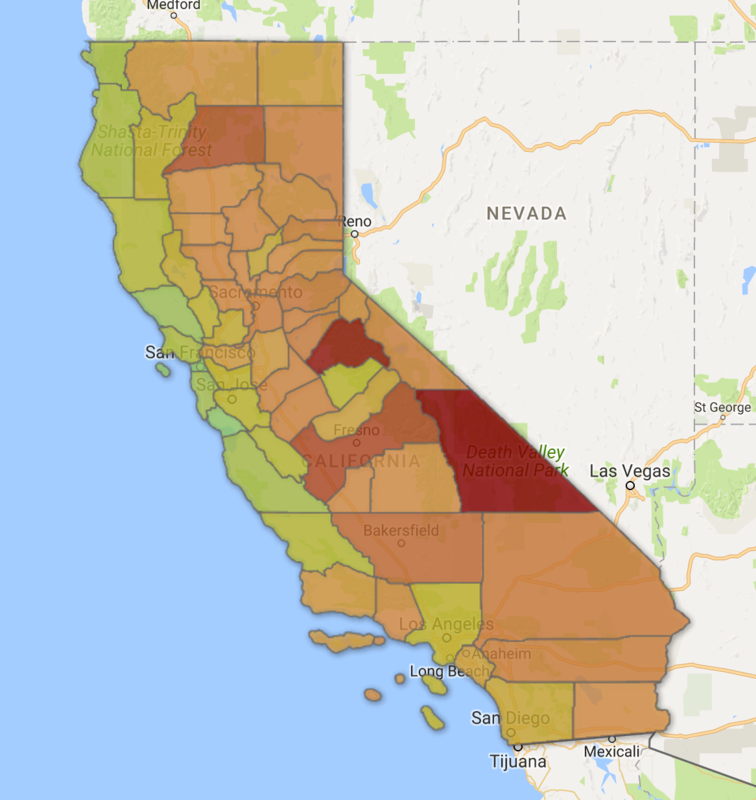 Left: A map of per-capita water usage by county in California. Data from USGS, map made with Google Fusion Tables. 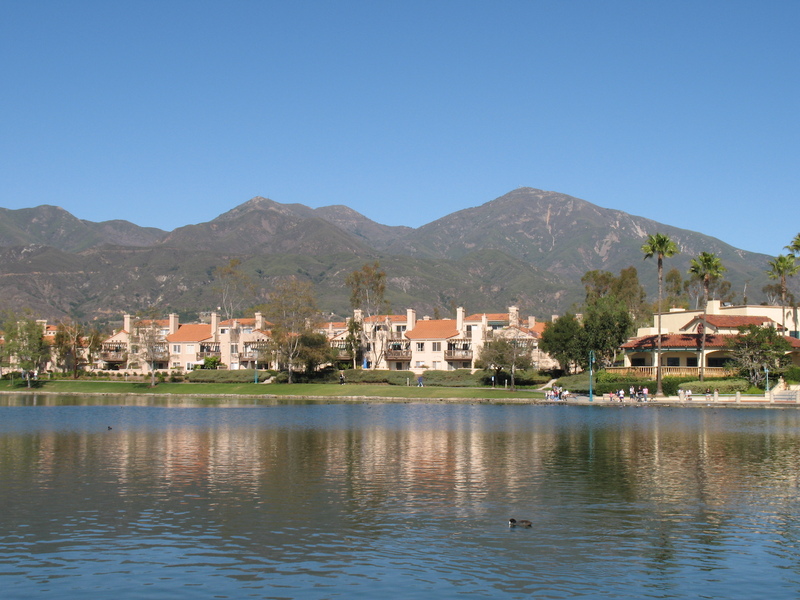 Right: Central Rancho Santa Margarita features green lawns and a huge artificial lake. Image from Wikiepdia user "Bighead." Past the Granite and Providence Mountains, where the rain that may soon be destined to trickle to Orange County falls, in the middle of the Mojave National Preserve (essentially a protected area, similar to a National Monument and less restrictive than a National Park, but approved by Congress instead of the President), lies the largest sand deposit in the Mojave. The Kelso Dunes are unimaginably vast — “dune” is a gross under-exaggeration. They are sand mountains, 650 feet tall. The landscape recedes as we climb up them, and scale becomes distorted. The self-similar dunes obscure their own size and in the basin below salt-bush brushes pylons and all begins to feel miniaturized. Looking down from the Kelso Dunes across the Mojave National Preserve. A handful of similar sand deposits dot the region. Everywhere that atmospheric effects have conspired to pull the desert soil into the sky and deposit it elsewhere, dunes form. 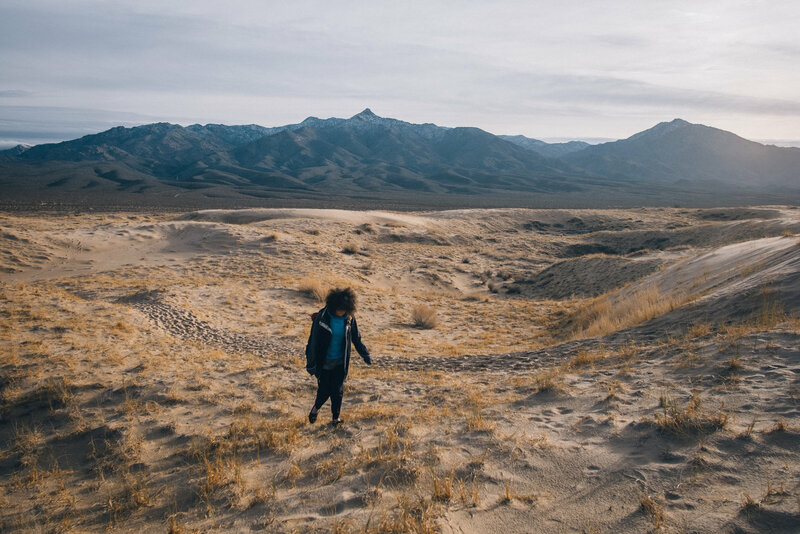 On account of its proximity to I-40 (which runs from Los Angeles to Las Vegas,) the Kelso Dunes are one of the most heavily visited, and while it is hardly crowded during our visit, boot-print trails thread through the sandscape. The Cadiz Dunes, just south of the citrus orchard built by Cadiz, Inc., are one of the most pristine sand deposits in the Mojave Desert. Before we leave Mojave National Preserve, we stop by the historic Kelso Depot, a restaurant and water stop for a century of Union Pacific trains. 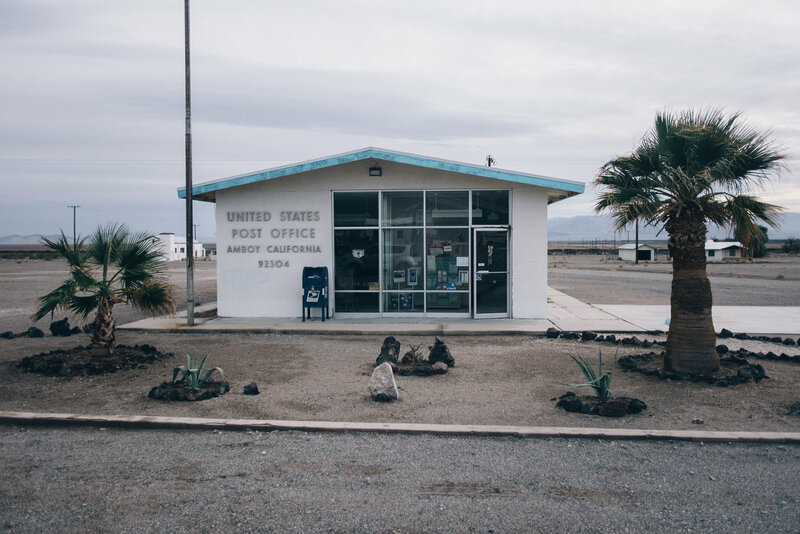 It is here, under the Colonial arches and in the wood-paneled baggage room that the deepest mark was made upon the Mojave — deeper than the ATV tracks on federal land and deeper than the wells drilled by Cadiz. The railroad carried iron from the Providence mountains and people to Las Vegas. The railroad sold off its checkerboarded land to pioneers and prospectors for gold and water. The railroad created towns, and named them alphabetically — Amboy, Bristol, Cadiz, Danby, Essex, Fenner. I sit outside to watch the sunset over the irrigated lawn and date palm survivors of past’s corporate garden. The cottonwoods and elms, planted by Union Pacific to shade this station, have been lost to decades of economic irrelevance. A military transport train rumbles through the depot, drawing attention to the third largest land owner — one our map has circled around without acknowledging directly — the Department of Defense. 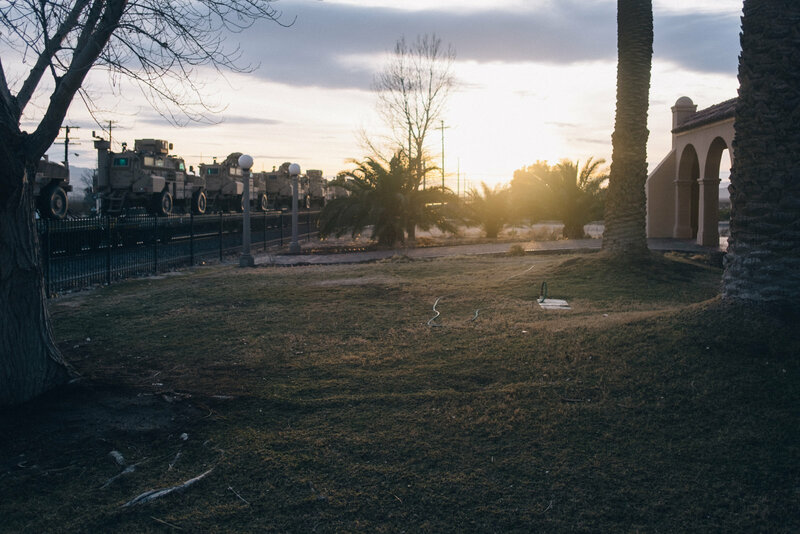 The train travels slowly, loaded with containers and humvees and MRAPs bound for the desert training ground 100 miles south in Twentynine Palms. A strange new economic bloom may be emerging in this solitary landscape of creosote and tortoises, driven by urbanization’s thirst for water and America’s now intractable, seemingly eternal desert wars. We drive on, and watch as dusk falls on the Joshua trees. Interactivity in this piece was based on a geographic storytelling demo built by Codrops. The map was rendered using Maperitive and Open Street Maps data. The water faucet icon was taken from Yazmin Alanis on the Noun Project. Text and images are by Logan Williams unless otherwise cited.